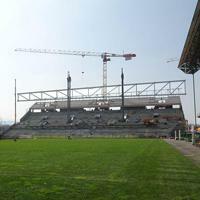 Pre-Euro 2016 redevelopment of Stade Geoffroy-Guichard is in full swing. After finishing the north stand expansion, workers are now revamping the west side and south end. The second one received a second tier balcony. According to plans the stand as whole will hold 10,000 people, with 8,000 of them lower tier Kop. Just as a reminder, Saint-Etienne is one of unique clubs worldwide that have two vocal supporter sections, behind both goals. Although most of the south kop concrete structure was retained, it may not be too easy to recognize in August, when the changes are done. A whole new roof structure will be added atop the new upper tier.